Government appreciates the sacrifices of the men and women in uniform, and will continue to provide the necessary logistics to enable them discharge their duty of ensuring law and order and protecting the nation’s borders, the President of the Republic, H.E. Nana AddoDankwaAkufo-Addo has assured. According to the President, ongoing operations such as CALM LIFE, COW LEG and VANGUARD, designed to deal with the menaceposed by landguards, destruction being wreaked on farms and farmers by nomadic cattle herders,and illegal mining popularly known as galamsey will also continue to receive special attention to ensure their success. President Akufo-Addogave the assurance in a speech read on his behalf by the Vice President, DrMahamuduBawumia at the 2017 General Headquarters West African Soldiers Social Activities (WASSA) Celebration of the Ghana Armed Forces held at Burma Camp, Accra on Wednesday 21st February, 2018. “The Government and people of Ghana continue to applaud and cherish the sacrifices that the Ghana Armed Forces make to contain armed robbery and other violent crimes through joint patrols with the Ghana Police Service” the President stated. “Your continued efforts in keeping our borders safe; your response to natural disasters; protection of our maritime domain and air space to secure our strategic assets; the provision of health services to many Ghanaians in areas where you are deployed; your protection of the environment, particularly in safeguarding our river bodies against illegal mining operations under Operation VANGUARD; and your continued community assistance programmes that bring smiles to faces of the deprived in our society are all greatly appreciated,” President Akufo-Addo added. The President continued: “In the later part of last year, upon the advice of the National Security Minister, Operation CALM LIFE was re-launched and charged with additional mandate to curb activities of violent land guards. The President commended the ongoing efforts to deal with the unruly activities of nomadic herdsmen, particularly in the Agogo and Drobonso areas, where there have been reports of looting and other antisocial behavior, and served a warning to all nation wreckers that the law would catch up with them. President Akufo-Addo expressed the nation’s condolences to the families of the men and women who have lost their lives while discharging their duty of protecting the State, and pledged the full might of the state in bringing the perpetrators to book. “I commend you for your patience in allowing due process of the law to take its course when the late Major Maxwell Mahama was murdered in May last year. “I also want to recall the recent murder of Sergeant George Boakye and to assure you all that our Police Service is investigating the matter in order to bring the culprits to book. “At this juncture, may I recall the unfortunate death of the two policemen who were recently killed while on Operation COWLEG in the Ashanti Region and the five soldiers who sustained various degrees of injuries when they were shot by nomadic herdsmen in Agogo in Asante Akyem North district of the Ashanti Region. 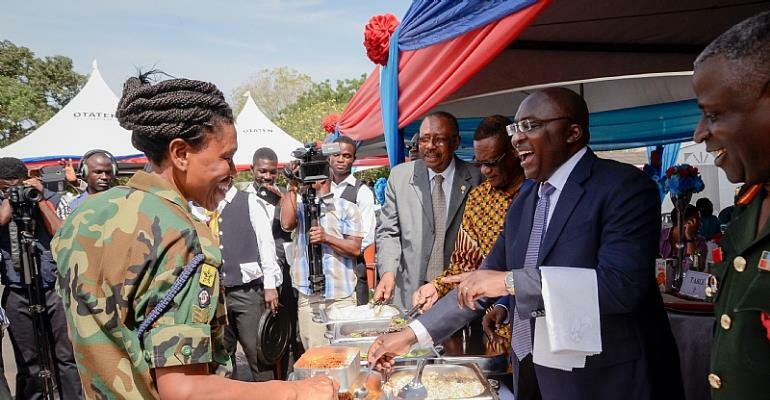 The 2017 General Headquarters (WASSA) Celebration of the Ghana Armed Forces was attended by past held at Burma Camp, Accra on Wednesday 21st February, 2018.